Lake of the Ozarks is the LARGEST man-made lake in America. It runs 98 miles, end to end, from Bagnell Dam to Truman Dam with over 40 miles of unsobstructed tributaries, over 1150 miles of shoreline and 57,000 acres of water. From main channel water and isolated coves to town and country living, we have it all here in Lake of the Ozarks area, all with majestic scenery and sunsets. Please "click" the links below for additional information. The Lake Area conintues to grow and develop in population, business and quality of life. 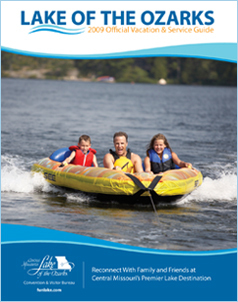 There is something for everyone at lake of the ozarks. A current copy of the Lake Sun Leader, so you can read up on all the latest news in your new hometown. (population 2,895) ˆ At the intersection of U.S. Hwy. 54 and Mo. Hwy. 5, Camdenton often is called the hub city of the Lake area. In and around the city are resorts, restaurants, retail businesses and golf courses. Significant attractions in the area include Ha Ha Tonka State Park and Bridal Cave. Dating to 1931, it is the Camden County seat and the major southern gateway to the Lake of the Ozarks. (population 4,926) ˆ Adjacent to U.S. Hwy. 54 and bisected by Mo. Hwy. 52. The community's retail opportunities (including several antique stores), golf course, lodging and dining make it a valued part of the Lake area's offerings for visitors. Eldon predates the Lake by nearly 50 years. As an established community not threatened by the rising waters of the new Lake, Eldon played a key role in the development of the area. (population 1,653) ˆ The early „heart‰ of the Lake area is on U.S. Hwy. 54, adjacent to Bagnell Dam. The first mile west of the dam, known to all as „The Strip‰ (and more recently as Bagnell Dam Boulevard), features boutiques, crafts, souvenirs, restaurants, arcades and other family amusements. Lake Ozark also provides access to the popular Horseshoe Bend area, with its resorts, golf courses and residential developments. After the dam was completed and the Lake filled in 1931, many businesses moved to the west side of the dam to begin serving the growing number of visitors. (population 675) ˆ A key community on the rapidly-growing west side of the Lake, Laurie sits astride Mo. Hwy. 5 at its junction with Rt. O. The community and nearby area offer resorts, restaurants, golf and shopping. A significant community attraction is the internationally-recognized Mary, Mother of the Church Shrine, honoring the mother of Jesus and all the world's mothers. (population 3,856) ˆ Named for a man-made sand beach on the banks of the Osage River, Osage Beach stretches along U.S. Hwy. 54 for eight miles. Many of the key traveler-serving facilities and attractions of the Lake area call Osage Beach home. The town offers the Lake area's widest variety of resorts, motels, restaurants, golf courses and entertainment. 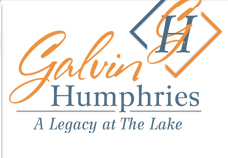 Included are the Lake's two music shows, entrances to the Lake of the Ozarks State Park, antique stores and an impressive selection of shopping opportunities (Osage Beach Premium Outlets, Stone Crest Mall, the Landing on Main Street, Lakeshore Plaza, High Point, etc.). (population 377) ˆ Popular areas on the west side of the Lake may be accessed via this strategic community on Mo. Hwy. 5. Sunrise Beach serves as the gateway to the family resorts, restaurants, campgrounds and water fun in the Hurricane Deck and Greenview/Rt. EE areas on the Osage and Niangua arms of the Lake. (population 2,597) ˆ Located at the junction of Mo. Hwy. 5 and Mo. Hwy. 52. Well north of the Lake, yet still an integral part of the Lake area, the town is home to the Morgan County Historical Museum in the old Martin Hotel. The area's golf, lodging, dining and shopping lure Lake-area visitors. The surrounding rural area is dotted with the farms of a thriving Mennonite community. Versailles dates to 1833 (and has been the Morgan County seat since 1854). To order the following complimentary relocation guide, just check the box to the left of the title and click "Send Me" at the bottom. You will then be prompted to enter your mailing information. Galvin will send you the guide once he has received your request.